The Valentine's Day lovefest on this site - who says scientists aren't warm and fuzzy? - is spectacular. You can learn about the chemistry of love with Valentine's Day science for women, easy solutions for the languishing lothario (personal favorites at the moment - "Roses are red, violets are blue. You and me we will stick like clay," and "I wanna be your Viking cleaner breathing in your dust. I wanna be your Ford Cortina I will never rust. "), and even a man-o-meter to help you scientifically choose the best date. To add to the hearty mix, I offer up the love circuit (thanks to Drugs Fut 2007, 32(5): 429 for the image). The relatively new field of explaining the biology of romantic love, according to this article, posits four key areas in the brain are involved in all stages of love, from puppy to long-term to those recently lacking in love. The four - the ventral tegmental area, nucleus accumbens, ventral pallidum and raphe nucleus - are tiny structures, but they are busy. They don't just work for love; they form part of the reward circuit for a number of feelings and behaviors, like drug addiction. The VTA is the big man on campus. It is a group of neurons, mainly dopaminergic and GABAergic, located in the midbrain, and spits out dopamine to enhance the reward sensation. 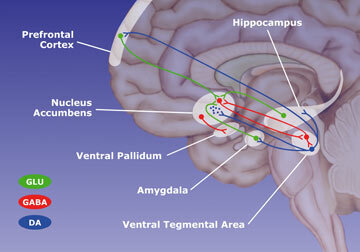 (As such, along with the nucleus accumbens, it is the primary site for drug addiction to work its magic.) This part of the circuit lit up when pictures of loved ones were shown to people undergoing fMRIs - both for people newly in love and still madly in love after 20 years. The nucleus accumbens flashed in brains of jilted lovers. The NAcc is a collection of mainly GABAergic neurons in the forebrain and is part of the pleasure center. Interestingly, it may also play a role in the placebo effect. The ventral pallidum and raphe nucleus joined the VTA in lighting up when those lucky few who are still madly in love after 20 years were shown pictures of their loved ones. The ventral pallidum is targeted by vasopressin, a hormone that influences pair-bonding (you may remember a flurry of research in 2004 on prairie voles), while the raphe nucleus, located in the brain stem, pumps out calming serotonin. Why study love biology? Social interaction disorders, like autism, might benefit. Dr. Helen Fisher, the "most referenced scholar in the love research community" and "world's leading expert on the topic of love," according to Wikipedia, studies the field in her capacity as scientific advisor to chemistry.com. And the pure underlying science is interesting too. There is the scary thought that love could be stimulated by manipulating these centers via pharmaceuticals. But Larry Young, of Emory University, says that you can stimulate the chemicals via intimate contact like hugging or kissing. that the "My wife tells me that flowers work as well. I don't know for sure," Young said. "As a scientist it's hard to see how it stimulates the circuits, but I do know they seem to have an effect. And the absence of them seems to have an effect as well."